We've enjoyed a gorgeous fall week as the calendar turns to October tomorrow. Typical fall weather will mean cool crisp mornings, pleasant afternoons, and occasionally breezy conditions ahead of passing cold fronts every few days. Some come through dry, others can pack a wallop. Our first true "autumn front" arrives tomorrow night and this one could pack the punch. Though the atmosphere is fairly dry right now, wind will switch around to the south overnight and become gusty tomorrow, ushering in Gulf moisture ahead of a potent front. The Storm Prediction Center is expecting some severe weather, mainly in the form of high wind and potentially large hail during the afternoon hours over Missouri and Oklahoma. Late in the afternoon, the storms should coalesce into a squall line that moves fairly rapidly eastward through Missouri and Arkansas. I expect that line to reach the Mississippi River sometime around midnight or very early Friday morning. Though it should lose a little energy as it moves into the Mid-Sough, the western portions of the metro area are in a SLIGHT RISK for severe weather with this system (see map below). The good news is that this front will move quickly and by Friday morning rush hour, the storms should be well east of us. Friday and Saturday will be back to coolish weather behind the front as high pressure briefly takes over. We'll be back to a rainy pattern by early next week it appears, though. Stay with MemphisWeather.net for the latest on the potential severe weather threat, interactive radar, and the most accurate forecast for Memphis. The rainy pattern of the past 2 weeks has finally shifted east today. Weak high pressure takes over this weekend before another cold front moves through Monday. However, this front will be dry. Thus, the MWN forecast reflects dry and warm weather this weekend, followed by cooler and much less humid weather behind the front for much of next week. In fact, dewpoint temperatures - a measure of humidity in the air - will be their lowest since spring. These low dewpoints will allow overnight temperatures to drop as well, with some locations in outlying areas near 50 by Tuesday and Wednesday mornings! We'll be watching for another front late in the week that could bring our next chance of rain. Interesting fact of the day: Though there was much more accumulating rain the week before last than this past week (at least in the metro area), the manual rain gauge co-located with the WXLIVE! rain gauge recorded 13 straight days of measurable precipitation. That string will come to an end today, and it's about time! To learn more about the CoCoRaHS program, a network of volunteer precipitation observers, click here. In the tropics, Tropical Depression #8 formed in the Atlantic a couple of days ago, but as of 3pm has deterioriated into an open wave, meaning it no longer has a closed circulation and cannot be classified as a depression. 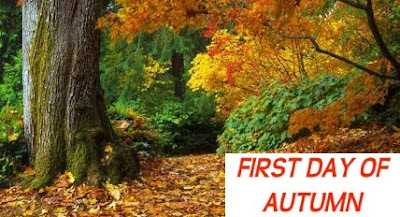 Fall starts at 4:18pm CDT today! Here is a sampling of totals since last Sunday (9-13-09), aggregated from a number of sources including official data, CoCoRaHS precipitation observers, and personal weather station owners. As you can see there are widespread totals of 4-6" across the board. Hickory Withe 3.0 SSE: 4.69"
Village of Arlington, TN: 5.03"
Sutton Place Subdivision, Cordova: 3.38"
Plantation Lakes, Olive Branch, MS: 5.38"
Brentwood Farms, Southaven, MS: 3/23"
Here is a map showing Doppler radar rainfall estimates for the Mid-South. Quite impressive totals! Red colors are 5"+ totals, while pinks highlight areas that have received 10"+! Unfortunately, the MemphisWeather.net Forecast calls for more of the same this weekend, though we may get a bit of a break on Monday before another system moves in towards the middle of next week and, possibly, stalls out, bringing more rain chances. And September is typically a dry month in the Mid-South! The weather pattern we have dealt with for most of this week looks to continue a couple more days, though the rain chances don't stop until we get well into next week. Yesterday it appeared there would be a fairly significant cold front that would move through on Monday or Tuesday and dry out the region and bring cooler temps. As we head towards fall though, I am reminded just how poorly the computer models can handle the onset of big pattern swings farther than 3-4 days out. I now have seen 3 consecutive model runs from the GFS indicating that that front will NOT make it in here early next week and instead of cooler, drier weather, we could see warmer (mid 80s) weather with above normal humidity and continued chances of rain well into next week. We'll have to see how it all plays out, but for now keep those umbrellas handy. The good news is that the Flash Flood Watch is set to expire at 7pm tonight, so the chances of very heavy rain will go down. Most rain over the next several days will fall during the daylight hours, with clouds, patchy fog, and maybe drizzle or light showers at night. The latest computer model extended forecasts are indicating that the current weather pattern over this region of the country may remain stagnant throughout the week and into the weekend. The pattern consists of a vertically-stacked low pressure system (meaning low pressure at levels of the atmosphere) that is sitting over the ArkLaTex (Arkansas-Louisiana-Texas border region) and moving very little. 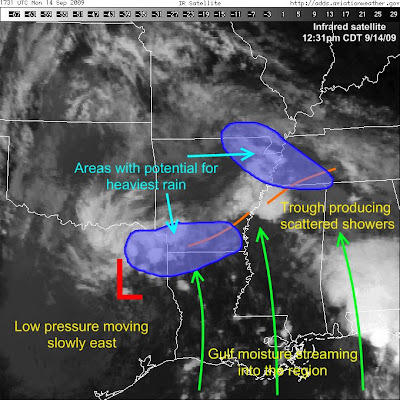 With southerly wind on the east side of the system, moisture is streaming north from the Gulf of Mexico into the Mid-South, southeast U.S., and Lower Mississippi Valley, producing very cloudy and muggy conditions and plenty of shower activity, along with some embedded thunderstorms. With no stronger systems approaching from the west to push this system on, the low moves very little and conditions don't improve. This has prompted the issuance of Flash Flood Watches for the entire region and occasional Flash Flood Warnings in areas where heavy showers occur. The map above shows the rainfall potential for the remainder of the week - the Memphis metro area could see 3-4" of rain over the next 5 days, following many reports of 2-3" on Monday. As we head towards the weekend and the low weakens slightly, I expect shower activity to become more diurnal in nature, meaning that more rain will be around during the daytime hours than at night. In addition, there will probably be more breaks in the clouds, which could promote heating of the lower atmosphere and additional lift, resulting in more thunderstorms versus showers. Extended computer models are also identifying a potential fall season cold front, with a strong push of cooler air behind it, to arrive early next week, which would pick up whatever is left of the persistent low and move it on, allowing skies to clear out and rain chances to dwindle. We'll hang on to that hope and, in the meantime, deal with soggy conditions for the next several days! Keep the umbrella handy, remember not to drive into areas where water covers the road, and always use headlights when windshield wipers are on. Thanks to low pressure at the middle levels of the atmosphere, the work week has started off wet across the region. The low, which spun off the Texas coast late last week and has moved slowly into eastern TX now, will continue to slowly move east into the Lower Mississippi River Valley the next few days. The Mid-South is positioned ahead of this system, which is bringing up copious moisture from the Gulf of Mexico. As impulses rotate around the low, and with plenty of moisture in place, showers break out - some producing heavy rainfall. Reports of 2" or more of rain have come in from across northern sections of Shelby County this morning. As for the forecast, with the low meandering around to out southwest, the Memphis metro region will continue to be in a favored area for occasional rain, some heavy, though with very littlt thunder thanks to limited instability, or lift, in the atmosphere. This pattern will continue through mid-week. Widespread 3-4" rain totals are possible this week. The rain will help keep temperatures down to near 80 or below, though humidity will remain high. Drier conditions are expected late this week, with a cooler and drier autumnal airmass possibly moving over the region next week. For the last several days, most of the scattered shower and thunderstorm activity has been confined to northern Mississippi, though a few heavy showers have popped up over the metro region as well. That pattern will continue one to two more days before rain chances increase across greater Memphis late in the weekend and early next week. Increased rain chances will be in response to an upper level low that will gradually move closer to the region and hang around into the first half of next week. That will result in a daily chance of rain and the potential for some heavy pockets of rain or flash flooding due to the slow motion of this system and the weak wind aloft that will cause individual showers or storms to be slow moving. The 5-day precipitation forecast from NOAA (above) shows where the potential for heavier rain will be through mid-week. The areas to our south will continue to have the greatest chance for rain. With all of the outdoor activities planned this weekend, I wouldn't cancel any plans, but it would be a good idea to keep an umbrella handy! Rain chances are about 40% for events like the Germantown Festival and Southern Heritage Classic. The good part of this setup is that cloud cover will remain fairly abundant, so daytime highs will be tempered - mainly in the middle half of the 80s, though it will also serve to keep overnight lows from dropping much, remaining in the upper 60s to lower 70s. Check out the MWN Forecast for all the details. Most Mid-Southerners are aware that the weather during the summer months in this region varied widely, from a very hot June with a strong mid-summer storm thrown in mid-month, to a much cooler than normal July and August with two metro-area tornadoes on July 30. Precipitation ranged from very wet in July to below normal in August. So how did it average out? The maps below show the "departure from normal temperature" for June 1- August 31, as well as the "percent of normal precipitation" for the same period. Click the images for larger views. One the temperature side, the Northern and part of the Central Plains and the Great Lakes regions experienced a very cool summer, with much of the Northeast also averaging somewhat below normal. Here in the Mid-South, the extremes of June and July ended up averaging out to about a degree below normal, though portions of northeast Arkansas were 2-3 degrees below normal. 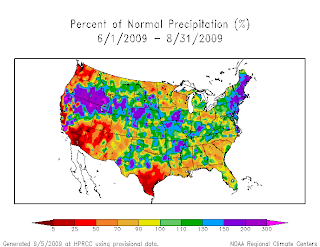 As for precipitation, the Northeast was wet, along with parts of the Midwest, while southern Texas (which is still in a significant drought) and the Gulf Coast were below normal. 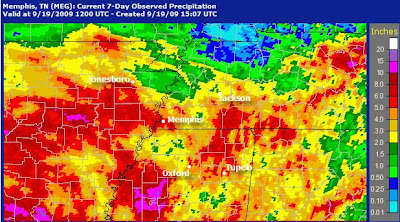 Examining the Mid-South, the anomalously high precipitation amounts over northeast Arkansas explain the below normal temps, but most of the region was above normal for the summer. After a considerably cool July, August ended up also being cooler than average, though precipitation was also below normal (versus July when it was well above normal). Following are climate summaries for Memphis and Bartlett, TN. At the airport, the average temperature was 79.9 degrees, which was 1.3 degrees below normal. The highest temperature for the month was 94 degrees set on the 4th and 15th and the lowest was 61 on the 31st. A total of 16 July days saw highs at or above 90 degrees. No temperature records were set in August. Though August is typically a fairly dry month, only 1.21" of rain was recorded for the month, which was over 7" less than in July and much less than the average of 3.00". There were 6 days with measurable rainfall recorded but only 3 days with more than a tenth of an inch. The peak wind gust was 47 mph, recorded on the 10th. Click here for the NWS climate recap for August. WXLIVE! also recorded a cool and somewhat dry month. The average temperature for August was 77.5 degrees, with a max of 94.9 on the 4th and a min of 57.0 degrees on the 24th, one of 4 days near the end of the month that dropped into the upper 50s. Precipitation totaled 2.23" for the month, one inch more than at the airport. The peak wind gust was 28 mph on the 5th. 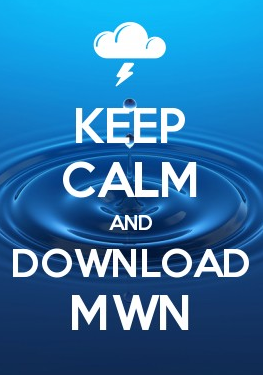 Click here for the MWN recap. 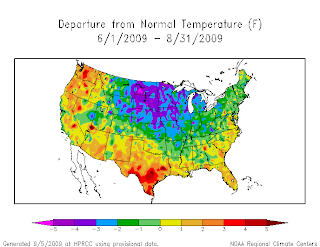 The MWN Forecast turned in its month impressive month of 2009 in August with an average temperature error of just 1.60 degrees for all forecasts, besting the computer models and the National Weather Service once again. Accuracy statistics can be found here.